To grow the seedling rice well, the pipe house decided to be built. I want to introduce how to assemble a pipe house on the market. The house built this time is width: about 4.5m and the depth: about 7m. 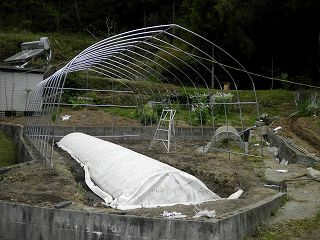 I want to try the greenhouse cultivation of the vegetable. The pipe house is a greenhouse sold as a commodity "Garden house H-4572". Width : about 4.5m and the depth: about 7m and height: about 2.7m and acreage: about 9.4 tsubos and gross weighs: It is about 137kg. The initial position decision is very important. It becomes a transformed house, and convenience becomes bad if it doesn't firmly position it. The pipe house chooses the place where the wind doesn't drive so much because it is weak to the wind. It is the best near a mountain and an existing building. I made it between the main building and the mountain. The stake of the standard is driven in. Next, the right angle is put out. Length becomes and the triangle at 3:4:5 becomes a right-angled triangle about the vicinity. The line of 3m and 4m is drawn from the reference point by using this character. And, if the opposite side is adjusted to 5m, the right angle can be made. Next, the position of the four corners of the site in the house is decided measuring it with the tape measure. The pipe for the leg is put up. The perforation parts of the attachment are assembled, and the hole of about 45cm in depth is made for the position of the leg with a hammer. The leg pipe in four corners makes it come to the edge of the passing pipe sidewise. Other leg pipes are adjusted outside of the passing pipe sidewise. Next, the pipe for the leg is buried under this hole. The leveling string is put on the sign for the leveling string from under the pipe for the leg to the position of 60cm with the pin. And, the burial size of the pipe for each leg (about 45cm) is decided so that this leveling string may become the horizontal. I brought the a level to the center of the leveling string to decide the horizontal of the leveling string and measured it. Driving the pipe for the leg is battened down, and beaten with the hammer. The arch pipe is inserted in the leg pipe and it assembles it. First of all, universal collaboration 25*19 is installed in a top part of the arch pipe for the back and forth. Next, the arch pipe is assembled. The arch pipe is previously united and it inserts it in the leg pipe. This goes well when doing by two people. The leg pipe is bent as internally as possible and the arch pipe is installed. The face and the head are made to come to the position without danger even if the arch pipe splashes. Five passing pipes are installed in the arch pipe sidewise. T band and the hook band are used. The passing pipe was adjusted to the position of the leveling string sidewise about the lower side. The passing pipe is made the seam of the pipe sidewise about the upper part. The passing pipe installs the top in the above-mentioned universal collaboration 25*19 sidewise. There is no especially difficult point if it does according to the assembly manual. The shape of the arch might not become becoming of current assembly according to the desire because of a slight difference between the type of soil and the size though there is no problem according to the size. At that time, there is only doing flexibly. I was soft the type of soil or became improving a little the height of the arch. The shape of the arch can be corrected a little at the installation position of a horizontal bar, and each one must assemble it devising it. This photograph is a pipe house that unites to an arch and a back pipe and goes up. It stores on the transformed site just well. It is an ordered size. In the built house, there is a vinyl tunnel for the rice nursery of this year's rice plant. The seedling is grown in this raising tunnel this year. This house will be used from next year. The door is assembled according to the assembly manual. After the hinge and the premium are installed, the vinyl sheet is put on the door. As for both sides of the vinyl sheet, the direction that can be read is positioned to the character correct on the outside. Long Packer is cut and handled for the installation of the vinyl seat. Next, the door is installed in the main body. The vinyl seat is put. The side vinyl seat is put according to the assembly manual. Next, the heaven vinyl seat is put. As for both sides of the vinyl, the direction that can be read is positioned to the character correct on the outside. Packer stops the vinyl. The stake screws in, and the vinyl seat is held. Ten stakes screw in outside both sides about 5cm. The color wire is installed in the stake. The color wire is put with the turnbuckle of the attachment. R band is put between each pipe in each arch part and the vinyl seat is suppressed. It ties to the color wire R band ahead. The temperature adjustment of the greenhouse is done by the open close of the vinyl seat on the side. The temperature rises generally too much as for the vinyl greenhouse in summer. Then, to lower the temperature, the side is ventilated. The vinyl can be easily raised and lowered by using the vinyl rolling up container for the side ventilation. Or, there is a person who installs the ventilation fan, too. It is costly though is convenient when the temperature is adjusted by the automatic operation.